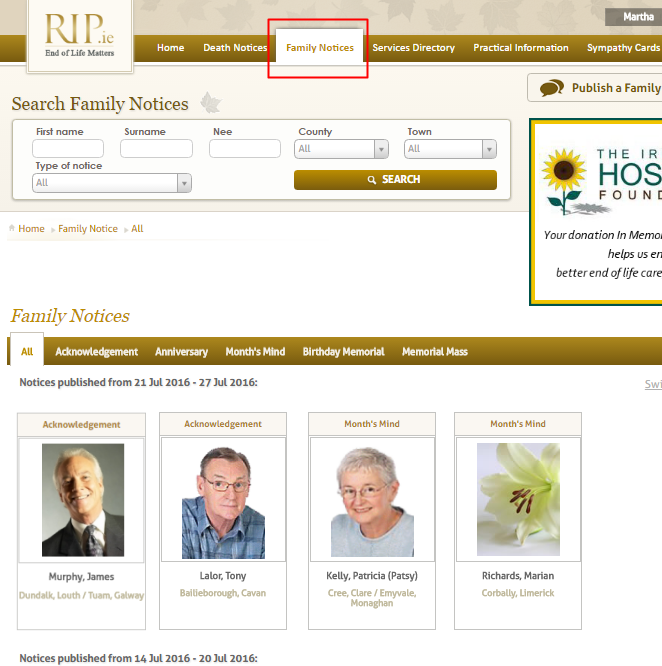 Family Notices - Where to find on RIP.ie? On the top navigation toolbar on RIP.ie, you will see a new tab called "Family Notices" (highlighted below with a red box). This is where all Family Notices are displayed to the public for up to 5 weeks (depending on the length of time specified by the family). When clicked, the "Family Notices" tab displays "all" current Family Notices by default, as shown below. These may be sorted according to type of notice e.g. Acknowledgement, Month's Mind, Anniversary etc. Where no photo of the deceased has been included, the flower image displays by default.